October 21, 2015 – the day Marty McFly and The Doc flew into the future. This future. It’s here! Sure we don’t have flying cars, hover boards or self adjusting jackets – but if you come to Collingwood next week you might spot Biff coveting his Grays Sports Almanac amongst Back To The Future lovers in congregation and nerding out hard. ‘Bootleg to the Future’ is the debut, solo art show and ultimate ‘Back to the Future’ tribute by Melbourne-based artist and designer, Callum Preston AKA “The Tooth” from Everfresh studio. 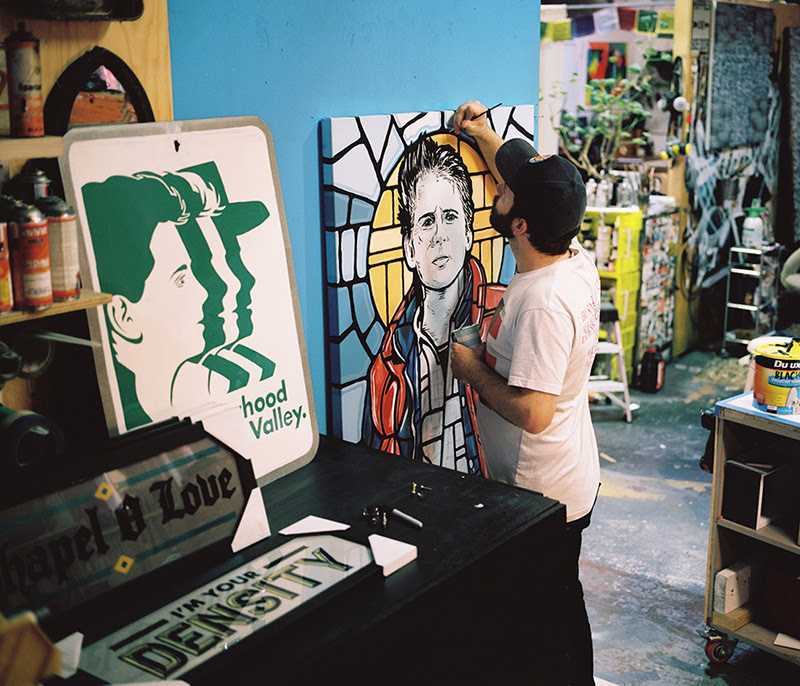 Callum has been a member of Melbourne artist collective “Everfresh Studio” since 2005 and exhibiting in street art-based group shows since 2003. What will un-doubtingly be the ultimate expression of love for the trilogy, expect to see a miscellany of work in a collection that includes; canvas and paper works, sign writing, replica props, costume designs, sculptural work and collage, characterising Callum’s favoured moments. For the heavy BTTF fans, prepare to lose yourself in a nostalgic haze of the notorious and make believe Hill Valley, California. As well as exploring the theorised gang activity in the town and prototype Hoverboard research and development. If all of that didn’t generate 1.21 gigawatts in your pants then Callum’s crowning glory will. A true-to-scale “Lost boys-style, treehouse” interpretation of the DeLorean Time Machine: built by hand entirely out of timber, found objects, and discarded electronics“. This movie is out of this time paradox and you can bet a large hydrated pizza I’m gonna be hustling for a selfie with the flux capacitor.